FREE January 27-31 at Amazon! Now bundled in this digital collection, the fifth Miller’s Creek novel A BRIDGE UNBROKEN and its companion Bible study THE FRAGRANCE OF CRUSHED VIOLETS both explore the difficult topic of forgiving the inexcusable. Frightened and on the run, Dakota Kelly just wants to erase the painful past. But her plan to start afresh is derailed when she co-inherits her late grandfather’s farm with her high school sweetheart–the one responsible for the scars on her heart. Unfortunately, he’s not the only ghost from the past. Someone else is on her trail and will stop at nothing to get what he wants. Will Chance and Dakota lay aside old wounds and a harbored secret to restore the old farmhouse and bridge, or will evil forces sabotage their attempts to forgive? What do we do when someone seems determined to bring us down through an attack that is personal, public, and unfounded? How do we deal with meaningless acts of destruction especially when the offender shows no remorse? In short, how do we move past the emotional pain to a place of forgiveness? The Fragrance of Crushed Violets: Forgiving the Inexcusable is a companion Bible study booklet on forgiveness written to go along with the spiritual theme of the fifth Miller’s Creek novel, A Bridge Unbroken by Cathy Bryant. The book is designed to work for either individual or group study. A women’s Bible study group has been formed on Facebook, and will be studying the topic of forgiveness using this book beginning July 1, 2014. We would love to have you join us at LifeSword: https://www.facebook.com/groups/LifeSword/. What do we do when a loved one, boss, co-worker, friend, or enemy seem determined to bring us down through an attack? How do we handle it when their assault is personal, public, deep, unjust, unfair, and unfounded? Take it one step further. How do we deal with meaningless acts of destruction and death, say in something similar to the Twin Towers incident or a school shooting, especially when the offender shows no remorse? Do we file it in our brains and rack it up to “one more senseless act” and chance to think that God somehow messed up? In short, how do we move past the hurt and anger to a place of forgiveness? 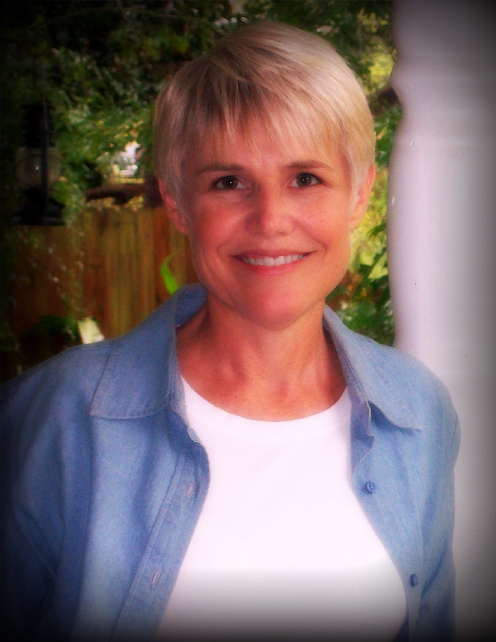 Cathy Bryant writes both Christian fiction and devotional materials. She’s written devotions for The Upper Room devotional magazine, two devotional books, and for various online devotional sites including her own website, http://www.CatBryant.com. The Fragrance of Crushed Violets is her first Bible study booklet. Cathy’s standalone novels are set in the fictional town of Miller’s Creek, Texas, where folks are friendly, the iced tea is sweet, and Mama Beth’s front porch beckons. Her debut novel, Texas Roads, was a 2009 ACFW Genesis contest finalist and has been on the Amazon Kindle Best-Seller list. Since then she’s added four other books to the Miller’s Creek novels, the latest one released in Spring 2014. Readers have compared her novels to those of Karen Kingsbury and Nicholas Sparks and have called Miller’s Creek the Texas version of Mayberry. A native Texan, Cathy currently resides in the beautiful Sangre de Cristo mountains of northern New Mexico with her minister husband of over thirty years. When she’s writing, you can find her rummaging through thrift stores, hiking through the wilderness, or up to her elbows in yet another home improvement project in the mountain cabin she calls home. 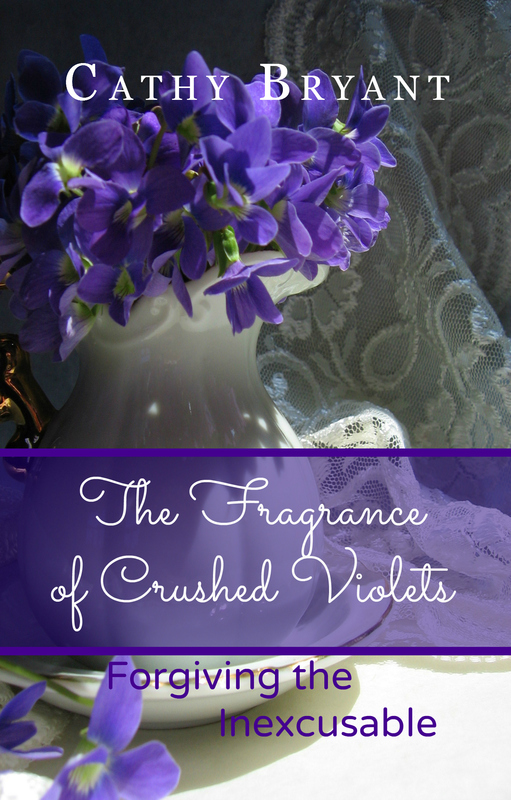 Cathy has generously offered to give away one digital copy of The Fragrance of Crushed Violets. To enter, please leave a comment, along with your email address. This giveaway ends Sunday, June 22 at midnight CST. The winner will be drawn and announced on Monday, June 23. Good luck!! Welcome to the BlitzKat blog tour for Cathy Bryant’s A Bridge Unbroken. Another Miller’s Creek Novel set in the heart of Texas, A Bridge Unbroken brings two new characters to the forefront while still giving fans a glimpse of their favorite characters from the past, including the old geezers and Mama Beth. Dakota Kelly wants her painful past to disappear. A plan to start afresh is derailed when she co-inherits her late grandfather’s farm with the man responsible for the scars on her heart. But Chance Johnson isn’t the only ghost from the past. Someone else is out to get her and will stop at nothing to get what he wants. Will Chance and Dakota lay aside their grudges to restore the old farmhouse and bridge, or will evil forces sabotage their attempt at forgiveness? Click HERE to read a sample chapter of A Bridge Unbroken. 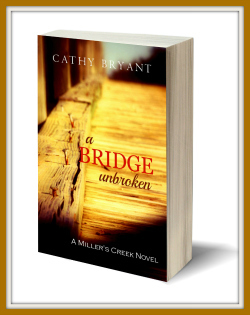 A Bridge Unbroken is Book 5 in Cathy Bryant’s Miller’s Creek novels. While fans of the series are sure to welcome the newest addition, A Bridge Unbroken can easily be read as a stand-alone novel. I thoroughly enjoyed the community of Miller’s Creek and its residents. Dakota Kelly and Chance Johnson are strong characters, left vulnerable by the physical and emotional scars of their pasts. Their journey, full of suspense and romance, is one of faith and forgiveness. I loved the unexpected plot twists, as well as the beautiful spiritual messages! A Bridge Unbroken is a touching, engaging story and one that I highly recommend to fans of inspirational romantic suspense! Cathy has generously offered to give away one e-copy of A Bridge Unbroken. To enter, please leave a comment, along with your email address. This giveaway ends Sunday, May 25 at midnight CST. The winner will be drawn and announced on Monday, May 26. Good luck!! A native daughter of the Lone Star State, Cathy loves spinning tales about life in small town Texas. When she’s not weaving stories about the fine folks in Miller’s Creek, you’ll find her rummaging through thrift stores, feeding her reality TV addiction, or up to her elbows in yet another home improvement project in the mountain cabin she shares with her minister husband of over thirty years. 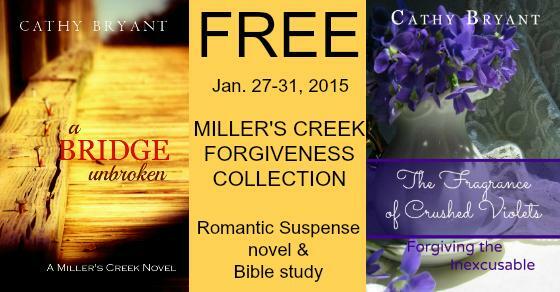 You can find out more about Cathy and her books at http://www.CatBryant.com. And reader friends on Facebook may want to visit the following groups, the first for book bargains and the second to discuss all things Miller’s Creek. Cathy is celebrating the new addition to the Miller’s Creek family by making several prizes available to reader friends, including a $100 Visa Card Giveaway. Winners will be announced at the interactive Facebook Launch Party on May 22, 2014. Other prizes include: t-shirts, coffee mugs, tote bags, bookmarks, eBooks, print books and Amazon Gift cards. Enter the grand prize drawing for the $100 Visa Card by clicking one of the links below. Hurry, because the contest ends May 22, 2014. (NOTE: Some contest tasks can be completed daily for extra chances to win.) The grand prize winner will be announced at the A Bridge Unbroken Facebook launch party on May 22. CLICK HERE TO ENTER THE DRAWING VIA CATHY’S WEBSITE. CLICK HERE TO ENTER VIA THE GIVEAWAY TAB ON CATHY’S FACEBOOK PAGE. Don’t miss the fun! See you at the party!